Joni Mitchell as a musical artist, has been restlessly innovative, her music evolved from deeply personal folk styling into pop, jazz, avant-garde, and even world music, presaging the multicultural experimentation of the 1980s and 1990s by over a decade. Fiercely independent, her work steadfastly resisted the whims of both mainstream audiences and the male-dominated recording industry. While Mitchell's records never sold in the same numbers enjoyed by contemporaries, none experimented so recklessly with their artistic identities or so bravely explored territory outside of the accepted confines of pop music, resulting in a creative legacy which paved the way for performers in a broad range of genres to cover her songs. Born Roberta Joan Anderson in Fort McLeod, Alberta, Canada, on November 7, 1943, she was stricken with polio at the age of nine; while recovering in a children's hospital, she began her performing career by singing to the other patients. After later teaching herself to play guitar with the aid of a Pete Seeger instruction book, she went to art school, and became a fixture on the folk music scene around Alberta. After relocating to Toronto, she married folksinger Chuck Mitchell in 1965, and began performing under the name Joni Mitchell. Thanks to all of the outside exposure, Mitchell began to earn a strong cult following; her 1969 sophomore effort, “Clouds,” reached the Top 40, while “Ladies of the Canyon” (’70) did better on the strength of the singles Big Yellow Taxi, and Woodstock, a major hit for Crosby Stills Nash & Young. The commercial and critical approval awarded her landmark 1971 record “Blue” was unprecedented: a luminous, starkly confessional set written primarily during a European vacation, the album firmly established Mitchell as one of pop music's most remarkable and insightful talents. After the 1974 live collection “Miles of Aisles,’ Mitchell emerged in 1975 with “The Hissing of Summer Lawns,” a bold, almost avant-garde record that housed her increasingly complex songs in experimental, jazz-inspired settings; The Jungle Line introduced the rhythms of African Burundi drums, placing her far ahead of the pop world's mid-'80s fascination with world music. “Hejira,” (’76) recorded with Weather Report bassist Jaco Pastorius, smoothed out the music's more difficult edges while employing minimalist techniques. Her next effort, two-record set “Don Juan's Reckless Daughter,” (77) was another ambitious move, a collection of long, largely improvisational pieces recorded with jazz players Larry Carlton and Wayne Shorter, Chaka Khan, and a battery of Latin percussionists. Shortly after the record's release, Mitchell was contacted by the legendary jazz bassist Charles Mingus, who invited her to work with him on a musical interpretation of T.S. Eliot's Four Quartets. Mingus, who was suffering from Lou Gehrig's disease, sketched out a series of melodies to which Mitchell added lyrics; however, Mingus died on January 5, 1979, before the record was completed. After Mitchell finished their collaboration on her own, she recorded the songs under the title “Mingus,” which was released the summer after the jazz titan's passing. Mitchell returned to her roots with “Night Ride Home,” (’91) a spare, stripped-down collection spotlighting little more than her voice and acoustic guitar. Prior to recording “Turbulent Indigo,” (’94) she and Klein separated, although he still co-produced the record, which was her most acclaimed work in years. She compiled a pair of anthologies, “Hits and Misses,” (’96) which collected her chart successes as well as underappreciated favorites. A new studio album, “Taming the Tiger,” followed in 1998. “Both Sides Now,” a collection of standards, followed in early 2000. Two years later, Mitchell resurfaced with the double-disc release “Travelogue.” She announced in October 2002 that this would be her last album ever, for she'd grown tired of the industry. 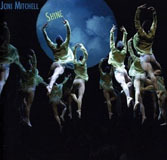 Numerous compilations and remasters appeared between 2002 and 2006, culminating in the release of the independent “Shine” in 2007. Herbie Hancock, a longtime associate and friend of Mitchell's, also in 2007 released “River: The Joni Letters,” an album paying tribute to Mitchell's work. Among the album's contributors were Norah Jones, Tina Turner, Leonard Cohen, and Mitchell herself, who contributed a vocal to the re-recording of The Tea Leaf Prophecy (Lay Down Your Arms) (originally on her album Chalk Mark in a Rain Storm). Hancock's recording won Album of the Year at the Grammy Awards. It was the first time in 43 years that a jazz artist took the top prize at the annual award ceremony. In accepting the award, Hancock paid tribute to Mitchell .At the same ceremony Mitchell won a Grammy for Best Instrumental Pop Performance for the opening track One Week Last Summer from her album Shine. Joni Mitchell Hopes to Spread "Fiddle"
Joni Mitchell's Muse Returns on "Shine"
All About Jazz musician pages are maintained by musicians, publicists and trusted members like you. Interested? Tell us why you would like to improve the Joni Mitchell musician page.